The Massachusetts Appeals Court issued a decision this week on appealing a lis pendens. This decision, DeLucia v. Kfoury (included below), discusses the process for doing so and the consequences of not filing a timely notice of appeal. A lis pendens is a notice of a pending lawsuit affecting “title to real property or the use and occupation thereof or the buildings thereon.” A lis pendens may be obtained by a party involved in such a lawsuit, by showing that the lawsuit affects real property and that the party has verified the lawsuit. Compared to a preliminary injunction, where a party needs to show a likelihood of success on the merits of a claim, a lis pendens is usually easier to obtain. Once approved by the court, a party can record the lis pendens in the land records, which puts the public on notice about the pending lawsuit. The practical implication of a lis pendens is that it keeps a sale of property from occurring: few buyers will want to purchase property knowing that a lawsuit affecting its title remains ongoing. Under Massachusetts’s lis pendens law, a party has a right to appeal a lis pendens to a single justice of the Appeals Court. The purpose of this is to allow a party to have an immediate right of appeal. As a lis pendens can have serious implications for the sale of property, this right of appeal is intended to provide a “check” on this type of order. An appeal to a single justice of the Appeals Court, commonly known as an “interlocutory appeal” (done while the trial court case remains ongoing), comes with an important requirement: such an appeal must be filed within thirty days of the trial court decision. No exceptions exist for this deadline. In Delucia, the claimant attempted to appeal the lis pendens decision after this deadline. The Appeals Court, in keeping with established law on this subject, held that the appeal was “dead on arrival” due to being untimely filed. This is keeping with other, similar decisions on appeals with strict deadlines: if you do not timely appeal, the Appeals Court will dismiss the appeal. As the Appeals Court noted in Delucia, the dismissal of the lis pendens appeal was not too harsh of an outcome for the party seeking this appeal. Rather than attempting to appeal the lis pendens, a party can simply defend itself in the trial court case, and seek to have the case dismissed if it considers the matter to be meritless. Here, the dismissal of the appeal simply prevented the party from having an immediate appeal of the lis pendens; it does not mean that the lis pendens stays recorded in the land records indefinitely. For this reason, one should carefully consider the decision to appeal a lis pendens. The time and money in doing so might be better spent on the underlining trial court case which, if dismissed, would consequently end the lis pendens. Nonetheless, Delucia is an important reminder of the importance of timely filing an appeal. If you find yourself dealing with a lis pendens, contact me for a consultation. An experienced real estate litigation attorney can help you determine the best way to address this legal matter. A real estate purchase agreement is an essential part of buying or selling property. Understanding the importance of these agreements is essential for avoiding potential problems later on in the sale process. Massachusetts, like most states, has a statue of frauds, a law requiring that certain types of agreements be in writing to be enforceable, including the sale of property. With few, limited exceptions, an oral agreement will not suffice when real estate is involved. Importantly, the type of writing allowed for such agreements is broader than a traditional written contract. A recent Land Court decision found that a binding agreement for the sale of property was created through text messages, and similar decisions have held that emails are also sufficient for satisfying the statute of frauds. For the sale of residential property, there are two common types of real estate purchase agreements: an offer to purchase real estate and a purchase and sale agreement. An offer to purchase real estate is just that: a written offer for the sale of property. These agreements are generally one or two pages and contain the “bare bones” terms of the sale. When the parties are ready to move forward with the sale, a purchase and sale agreement is generally negotiated and signed. This agreement contains more information on the sale of the property, which generally comes after the parties have had more time to seek financing and discuss the specific details of the sale. The most important thing to remember about real estate purchase agreements is that such agreements are generally binding contracts. If signed, a party is generally committed to selling or buying the property. There can be defenses to such agreements, but a seller or buyer should exercise extreme care in signing one of these agreements. If you are involved in buying or selling real estate, hire a lawyer to assist you in drafting a real estate purchase agreement. An experienced attorney will know what to include in these agreements and how to include contingency clauses that excuse a party from performance if they are not able to buy or sell the property. If you need to enforce or defend a real estate purchase agreement, you need an experienced real estate litigation attorney on your side. An attorney will help you in determining the right cause of action for your case and know the ways that the legal system can protect your interest in the property while the legal case is ongoing. If you need help with one of these cases, contact me for a consultation. Buying your first home can be both an exciting and stressful experience. While home ownership is, to many, the height of financial success, the process of purchasing a home has many traps for the unwary. As a lawyer involved in real estate litigation, my cases generally come to me when things go wrong. Here, I want to share some legal tips for buying your first home that can help avoid these pitfalls and make the experience as easy as possible. A large portion of my practice consists of foreclosure defense. While I have helped many, many homeowners save their homes from foreclosure, I always maintain that the best way to beat foreclosure is to avoid it in the first place. With this in mind, a potential home buyer should always speak with a financial expert prior to making an offer on a home. An expert can help you identify a home that meets your budget and offer advice for covering the many expenses that come with home ownership. Buying your first home is an enormous financial investment, one that a financial expert can be a great help with. Enforcing any oral promise is tough to do, for the simple reason that it is tough to prove one’s word against someone else’s. In real estate, oral promises are even more problematic due to the statute of frauds, a legal requirement that most contracts for real estate be in writing. Without such a writing, it can be difficult (and many times, impossible) to enforce an oral promise. Make sure that all matters concerning the purchase of your first home are in writing. When looking to purchase a home, many potential buyers are tempted to purchase homes that include a rental unit, to offset the expenses of home ownership. Rental property can be an excellent investment, but you need to give careful consideration to the demands of becoming a landlord prior to purchasing such property. Massachusetts has many, many requirements for landlords, and the penalties for not following these laws can be disastrous. Moreover, as a landlord, you’ll be responsible for maintaining the property and addressing the problems that will come up over time. Be prepared for these responsibilities before making this commitment. For a married couple, the process of addressing “who gets the home” during a divorce is difficult enough on its own. For home owners who are not married, the process can be even more complicated. If the non-married home owners split up, and are unable to agree on what to do with the home, a partition case may become necessary: a legal proceeding where the court determines who gets what, which can be long and expensive. With this in mind, be careful about making the commitment of purchasing a home with someone who is not your “permanent” significant other. If the relationship goes south, the process of dealing with the home can be a real hassle to resolve. When closing on a home, hire a lawyer. Buying your first home can be a complicated process, and having an experienced attorney on your side can make the process much easier. It may be tempting to try and do this on your own, but resist this temptation! A real estate attorney will review the necessary paperwork for your purchase and ensure that nothing is missing or incorrect. The small fee for this legal service will go a long way in avoiding problems down the road. Here’s hoping the purchase of your first home is a stress free and rewarding experience. In the event that a legal problem does arise, contact me for a consultation. The benefits of having an experienced attorney on your side can make all the difference in getting you the help you need. Summary judgment is a common part of civil lawsuits, and a topic that comes up frequently in discussing what to expect in litigation. Summary judgment applies to any civil case, but I wanted to do a post on this topic because it frequently comes up in discussions with clients on the course of a lawsuit. A lawsuit, simply put, is a demand for a court to offer a remedy against another party. This can include a demand for money, possession, or equity (such as a court order demanding a party to do, or not do, something). A party served with a lawsuit has an opportunity to present a defense and convince the court why it should not find for the plaintiff. After service of a lawsuit and an answer by the defendant, the parties have an opportunity to do discovery, where they can learn about each other’s case. Following discovery, the lawsuit is then ripe for trial. However, either party can seek a summary judgment motion as a means of winning the case without trial. To understand summary judgment, it is helpful to first understand the role of a trial in a civil case. The purpose of a trial is for the jury (or judge, if there is no jury) to decide which “side of the story” to believe. Doing so requires the judge or jury to hear the disputed facts and determine which side is more credible. Once doing so, the jury or judge applies these determined facts to the law, and offers a final judgment in the matter. Summary judgment is an attempt to get a court judgment without trial. Summary judgment requires a party to prove that (a) there are no genuine issues of material fact and (b) the moving party is entitled to judgment as a matter of law. For the first element, the moving party must show that the facts are not disputed. For example, in a landlord/tenant eviction for non-payment of rent, a landlord seeking summary judgment would need to show that there is a tenancy agreement between the landlord and tenant, rent is owed, and all of the required court papers were prepared and served. If the tenant disputes any of this, such as alleging that no rent is owed, there would be a dispute of fact, and summary judgment would not be allowed. Instead, a trial would be required. For the second element, “being entitled to judgment as a matter of law,” the moving party must show that the law provides the remedy they are asking the court for. It is possible to have a case where no facts are disputed, but the law simply does not provide the relief that the claimant is seeking. Summary judgment is often requested in lawsuits, as it avoids the need for a trial. Rather than putting on a full trial before a judge or jury, summary judgment can allowed a case to be decided solely on the papers, and avoid enormous time and legal fees. The decision to seek summary judgment, however, must be made carefully. I often seek lawyers attempt a summary judgment motion where the facts are clearly disputed, and the motion merely delays the case and adds unnecessary costs to the case. In some cases, simply bringing the case to trial is the much more logical choice. On the other hand, summary judgment can be effective at getting your case resolved quicker than trial. An effective summary judgment motion, however, requires that the facts and law be presented in a proper manner to allow for this relief. The benefits of having an experienced attorney on your side can make all the difference in winning a case on summary judgment. If you find yourself in need of help with a lawsuit, contact me for a consultation. An effective tool in pursuing a real estate dispute is a lis pendens. A request for a lis pendens often comes up in property lawsuits and can be useful for protecting one’s interest in real estate while a lawsuit is ongoing. A lis pendens, simply put, is a formal notice of a pending legal action. Per the law, a lis pendens is allowed for a lawsuit that “affects the title to real property or the use and occupation thereof or the buildings thereon . . .” A lis pendens must be signed by a judge, after finding that the underlining lawsuit is one that meets this standard. After a judge approves a lis pendens, it may be recorded in the appropriate registry of deeds as part of the land records. Recording a lis pendens, on its own, will not stop the buying or selling of property. The practical effect of a lis pendens, however, is to preserve the status quo while a lawsuit is ongoing. Few people will buy real estate knowing that a lawsuit affecting the subject property remains ongoing. Compared to a preliminary injunction (another legal tool for preserving the status quo during a lawsuit), a lis pendens is relatively easy to obtain. The lawsuit must be one that affects title to real property, and must be verified by the party seeking the lis pendens. This means that the party has affirmed, under the pains and penalties of perjury, that the facts of the lawsuit are correct. Prior to recording a lis pendens, the law requires the party to prepare an affidavit stating that notice of the allowance of the lis pendens has been provided to the other parties in the lawsuit by certified mail. In Superior Court, a lis pendens generally requires a hearing before the Court with proper notice to the other side. While not in the formal rules for other trial courts in Massachusetts, this is the general practice for most lis pendens requests: the court will likely only consider this relief upon notice and hearing to the opposing party. A party is permitted to seek a lis pendens on an emergency basis, by going to court first and not giving the opposing side notice (known as an”ex parte” action). However, a party needs to show a real emergency for doing so. If there is time for the court to hold a hearing and hear from the opposing side, the court will likely require a hearing. A lis pendens is an effective part of litigating real estate disputes. An experienced real estate litigation attorney can make a real difference in obtaining this relief and getting you the results you need. If you find yourself in a dispute that may justify a lis pendens, contact me for a consultation. Subject to section 15 of chapter 184, an affidavit made by a person claiming to have personal knowledge of the facts therein stated and containing a certificate by an attorney at law that the facts stated in the affidavit are relevant to the title to certain land and will be of benefit and assistance in clarifying the chain of title may be filed for record and shall be recorded in the registry of deeds where the land or any part thereof lies. Commonly known as “5B Affidavits”, these affidavits allow for the recording of information relevant to real property. 5B affidavits can be used to correct problems arising with Massachusetts real estate, such as potential problems involving the conveyance of property. I have found 5B affidavits to be useful for foreclosure related matters; a foreclosure by entry, which is a foreclosure that begins with the recording of a certificate in the land records, requires a homeowner to oppose this foreclosure within three years of this certificate’s filing in the land records. A 5B affidavit can be used as a means of preventing this type of foreclosure from occurring. 5B affidavits, importantly, must be certified by an attorney. The law does not allow a non-attorney to record one of these affidavits on their own. While 5B affidavits are commonly used for real estate matters, there is surprisingly little caselaw on the limits to how these affidavits can be used. Although the law is written broadly, for use in “clarifying the chain of title” for real estate, I take the position that an attorney should exercise caution in recording such an affidavit. A 5B affidavit should have a good faith basis in law and fact, and have a real purpose for the respective property it pertains to. An affidavit that does not meet this standard can potentially subject a property owner (and attorney) to potential liability. If you find yourself in a real estate dispute, contact me for a consultation. Drones have changed a great deal in the last several years. Once entirely used for military and warfare purposes, consumer drones are mainstream and increasingly being used for commercial and recreational purposes. The uses of drones are endless: home builders, surveyors, and even lawyers are finding that drones, and the ability to do aerial photography and video, is an incredible tool. Yours truly is an avid drone user. The picture below was taken by me with my drone from the Middlesex Fells in Medford, and shows my office location in Assembly Square, Somerville. This picture highlights a growing concern with drones: this new technology has an amazing ability to capture photographs and video that could not otherwise be seen before. Such use of aerial vehicles raises many legitimate concerns over privacy rights. 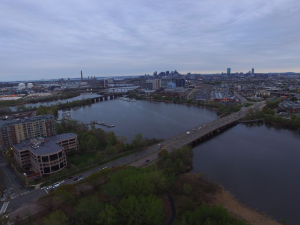 Here, I want to discuss drone privacy law in Massachusetts and discuss what can be done if you have privacy concerns arising from another person’s use of a drone. Massachusetts, like most states, is still grappling with how to regulate drones. Presently, Massachusetts does not have a statewide law regulating drones. This isn’t surprising; many states similarly do not regulate drones, although there are many proposed laws in state legislatures across the country. Here in Massachusetts, some local towns and cities, such as Newton, have passed local ordinances on when and where drones can fly. It is fair to say, however, that drone law in Massachusetts is very much in its infancy. An increasing problem with drones are privacy concerns. It is increasingly common to hear complaints about drones flying too closely to homes and places of business and taking unwanted photos and videos. With the limited laws on drones in Massachusetts, what can be done if you feel your privacy is being invaded by a drone? A person shall have a right against unreasonable, substantial or serious interference with his privacy. The superior court shall have jurisdiction in equity to enforce such right and in connection therewith to award damages. I’m not aware (yet) of anyone using this law in regards to a drone, but I suspect that Massachusetts’s Right of Privacy Act could be effective in dealing with the unreasonable use of a drone. This law, importantly, provides a court with equitable powers, allowing a court to issue an injunction, restraining order, or other declaration preventing someone from invading another’s privacy with a drone. 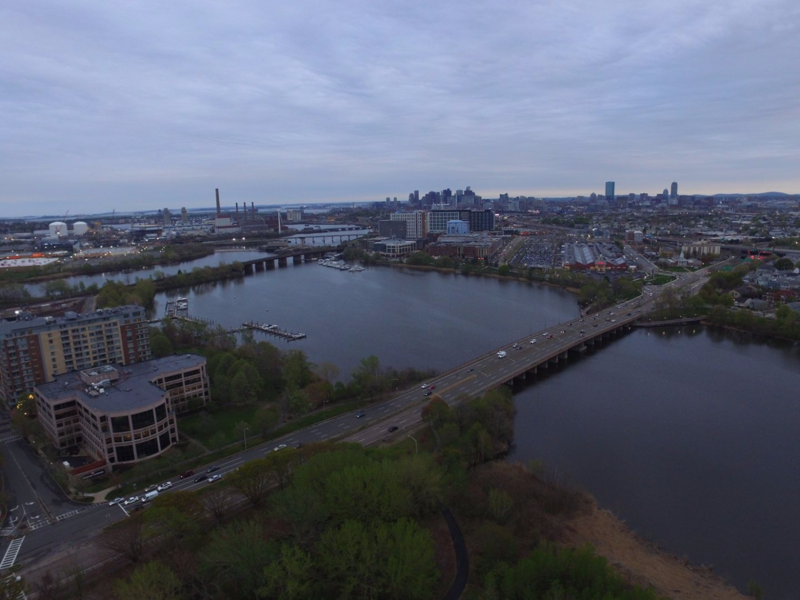 Once again, drone law in Massachusetts is new and it will be up to the courts to decide whether Massachusetts’s Right of Privacy Act and other existing laws cover drones. If you find yourself in need of assistance with one of these matters, contact me for a consultation.